Solar Lights 71LED 3-in-1 Outdoor Security Wireless Motion Sensor LED Floodlight perfect for patios, decks, pathways, stairways, driveways, garden, etc. 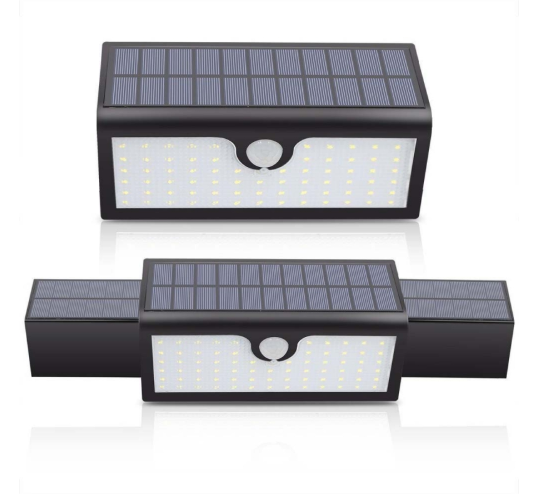 The outdoor solar powered motion sensor light requires No wiring and No tools! And it will turn on at night, and automatically off in the morning. Strong Long Light Mode/Dim Light Sensor Mode/Strong Light Sensor mode. When in dark night, the light will be dim without people coming near, however become bright if people comes, and the bright light will last 12 seconds until it returns to dim light again. In night, the light will be strong bright when people comes, then 12 seconds later, the light dies automatically.